Over the years, Yours Truly has written five books, has ghost-written sections of books for others, and has published over 800 printed articles—about 2.5 million words, not including my writings for the web. In a highly competitive, 24-hour a day global economy, businesses with "mission critical" applications find that any computer "downtime" at all has become unacceptable. PCs have become so integrated with so many business functions that any computer system problem whatsoever often grinds a company's operation to a halt, resulting in an immediate, tangible loss in dollars and cents. An amazing number of companies rely upon out-of-date, conventional desktop computers lacking "fault resilient" capabilities, which means that when such systems fail, they not only stay down for a considerable period of time, but in many cases data is lost—and data is a company's most precious non-human resource. This book will help you choose a computer systems that can "take a licking" and keep on providing service, even if one or more of its components fail. It should be read by anyone installing or overhauling a computer system that runs revenue-generating applications. If you want to grasp the full length and breadth of the rapidly developing computer telephony field, this book is the place to start. Author Richard Grigonis thoroughly explains even the most abstruse ideas in a concise manner that is aimed at all kinds of readers - students, business executives, telecom managers, call center supervisors or entrepreneurial developers. Each entry in this huge (640,000-word) encyclopedia is both an adroit exposition of computer telephony technology and a buyer's guide-like discussion of real-world products based upon technology currently available for business and residential communications solutions. Engineers loved the 80-page section that is a complete directory of all known plug-in PC telephony boards (from Dialogic, Natural Microsystems, Brooktrout, Bicom, etc.) manufactured in the world at the time of publication. 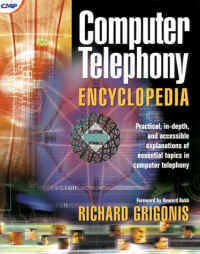 If you have only one book in your computer telephony reference library, make sure it's the Computer Telephony Encyclopedia. The events of September 11, 2001, were wake up calls, in more ways than one. Organizations have begun to have a more focused approach to disaster planning. But in today's perilous climate which not only includes terrorist attacks, but also the usual never-ending onslaught of hackers, crackers, computer viruses, "tele-thieves," earthquakes, fires, floods, lightning strikes, and other disasters, assuring the survivability of your organization is more challenging than ever before. 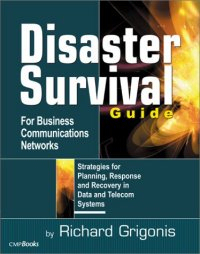 This book is written specifically for IT system administrators and telecom managers who want to protect their organization's increasingly complicated and diverse telecom and datacom networks, as well as the telephone systems, Internet sites, computers, and data-laden storage devices attached to them. This unique guide says that managers must take a new approach in protecting their assets. Instead of just implementing monitoring and detection measures with immediate intervention to combat disasters and ensure business continuity, managers should extend and intensify their security planning phase, reducing the possible magnitude of catastrophic incidents in advance by re-engineering their business to achieve a distributed, decentralized, and hardened organization. This can be done using the latest in communications technology (virtual private networks, conferencing technology, and the Internet) as well as networking and managing a new generation of the traditional "uptime" technologies (fault tolerant computer telephony, convergence, and power supply systems). With such a strategy, network and system administrators can now defend not just their telecom, information, and computing assets to the fullest extent possible, but can equally safeguard their most important asset - their employees. And whether it's identifying how hackers and crackers find vulnerabilities in your system, how unnoticeable levels of static electricity can shorten the life of electronic components, or how a centralized workforce can cripple recovery efforts, this book examines the full range of possible security and infrastructure weaknesses that can threaten a business, then helps you formulate and execute commonsense practices to counter them. Whatever your role in preserving your organization's operating functionality, network infrastructure, and data integrity, this book is a "must have" you'll find yourself referring to time and again. Ever wish that you could magically turn one phone line into four? Or 12? Or 24? And get high-speed access to the Internet in the bargain? This is the unprecedented opportunity offered by Voice over DSL (VoDSL), a technology that truly revitalizes the copper wires that for more than a century have connected all of the world's telephones. Now, at last, is a complete guide to VoDSL technology for every IT professional and decision-maker, with content easily accessible to anyone who needs to get up to speed fast on the technology and economics of implementing voice and data over DSL. This book will empower small and medium sized businesses that want to inexpensively create a call center, or establish a virtual private network for delivering data and voice communications to branch offices and teleworkers. The author first takes the reader on a short tour of the public telephone and data networks as they have existed in the past and present. He then examines the current realities of VoDSL, presenting comprehensive explanations of each of VoDSL's various guises and carefully detailing their advantages and disadvantages. After a discussion of what to look for in equipment and service providers, some compelling VoDSL-related business applications are presented. VoDSL's promise of reduced voice calling costs and genuinely integrated data/voice services is revealed to be an enticing proposition for businesses of every size, particularly small and medium-sized contact centers. Telcos, data access network operators, Building Local Exchange Carriers (BLECs) and various other types of service providers are also intrigued by VoDSL, since most communications companies earn their greatest revenue from voice services. Also, DSL's flexibility in allowing easy provisioning of new kinds of bundled voice and data services enable carriers to achieve high levels of service differentiation—even for the smallest customer—thus both maintaining subscriber loyalty and enhancing revenues. The book concludes with a preview of the future of voice and data services, how VoDSL will help usher in the era of the next-generation network, and a look at impending governmental legislation impacting on broadband in general and VoDSL in particular. Voice over DSL is a practical guide to both the technology and products of this emerging industry, and will benefit the curious small business owner as much as IT personnel in larger corporations. 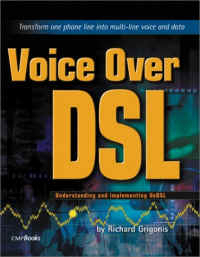 If you're considering dumping your old phone lines and switching to VoDSL, or want to glean some new communications ideas, or simply want a comprehensive reference for the VoDSL system you already own, this book offers the insights and guidance that you need right now. Over 3,500 definitions on 328 pages, with a foreword by voice-over-IP guru Jeff Pulver, founder of pulvermedia and the VON (Voice on the Net) conferences. At last! 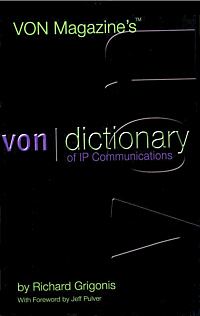 A concise, authoritative and portable dictionary that covers key topics in the exciting voice and data networking world. During the magazine's existence, over 53,000 readers stayed informed of Voice-over-IP and other cutting-edge communications developments by reading VON Magazine. 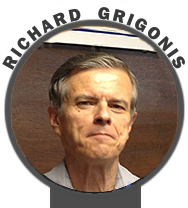 Now, Editor-in-Chief Richard Grigonis brings you an up-to-date compilation of easy-to-follow definitions of what you need to know in the rapidly evolving field of IP Communications. As the grand convergence of circuit-switched, packet-switched and wireless network technologies continues, you'll find this book to be an ideal, "must-have" resource. TO COME. There are about 800+ articles, about 353 of which have my byline on them. The others either don't have a byline (tagged "from the editors") or else were ghostwritten for some of my former employers.